Buying guide: Which kind of printer is right for you? 'Tis the season to be printing address labels, not to mention package labels and envelopes. There are several powerful and creative products available that will give you beautiful and festive results, ranging from free to $50. 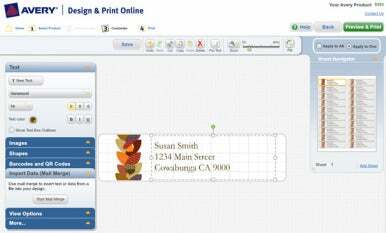 At the free end of the spectrum is Avery Design & Print Online, a Web-based utility for printing and merging contacts onto Avery's huge variety of labels. It also offers a sizable collection of clip art or lets you upload your own images to decorate holiday labels. If your needs are fairly modest, Avery Design & Print Online may fill the bill for you. 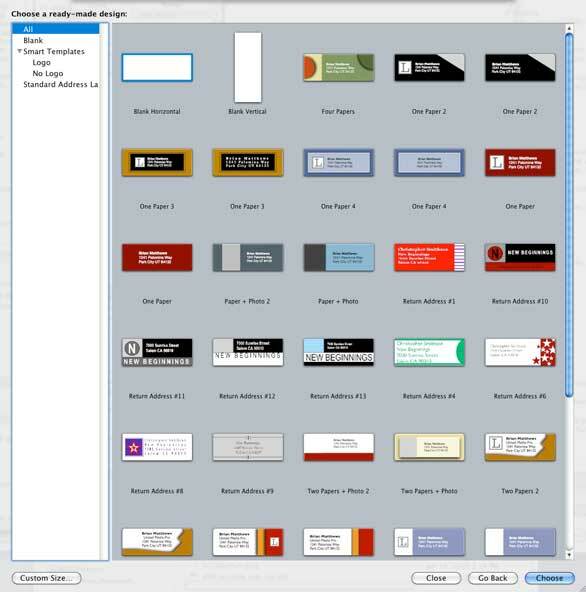 Avery's free online labeling utility is easy to use and provides lots of options. If you don't mind investing $40 to $50 in an enjoyable tool that will take you much, much further, consider programs like Chronos SOHO Labels 5 or BeLight's Labels & Addresses (formerly Mail Factory). Additional printing projects, including greeting cards and invitations, file folder labels, and individually numbered raffle and admission tickets. Support for more than 1,500 label stocks from companies including Avery, Dymo, Neato, HP, Imation, and TDK. They can pull names and addresses from Microsoft Excel and Entourage, Address Book, FileMaker, as well as text files. If you're using data from a text file, they can recognize names and addresses and put them into the right places for you. Some addresses are longer than others, so they adjust the font size as necessary to make them fit onto the label or envelope. They can add POSTNET and many other kinds of barcodes. These programs have their own unique features and interface, so here's a quick look at each. The $40 Chronos SOHO Labels 5 is a very slick program that takes advantage of some of the advanced capabilities of Mac OS X. (It requires Mac OS X 10.5.8 or later.) For example, it has a Cover Flow feature that lets you browse through the more than 650 included designs for labels, cards, letterheads, envelopes, and more. I was impressed with the quality of the designs, and you can purchase additional "iScrapKits" from the company's online store. The program has tools to draw shapes, place text on a curve, or fill text with an image, and it lets you apply dozens of impressive special effects to your photos. If you've ever wasted envelopes trying to print them correctly, you'll appreciate its envelope wizard, which helps you orient your envelope properly in your printer. SOHO Labels 5 supports label printers such as the Dymo LabelWriter, Seiko Smart Label Printer, and the Brother Label Printer. You can export your designs in TIFF, JPEG, PNG, and PDF formats. It also prints CD/DVD labels and inserts. Chronos SOHO Labels 5 is a full-blown design program as well as an intelligent label maker. BeLight's $50 Labels & Addresses has features similar to SOHO Labels. But it also has an industrial-strength engine designed for high-volume, international mailings. Its Art Text plug-in lets you create sophisticated text effects, and includes thousands of illustrations and more than 100 useful fonts. To give your message a truly personal flavor, have a font made from your handwriting. YourFonts, for example, will convert your handwriting to a font for up to $15, and the process is remarkably simple. Don't use ALL CAPS. With standard text fonts, using all caps seems unfriendly. And with script fonts, all caps can be ugly and difficult to read. Use the longest address in your address book to determine the maximum type size that will fit on your labels. Sheets of labels aren't cheap, which is why I get a sinking feeling when I see the final few addresses printing at the top of a new sheet and realize that the rest of the sheet will be wasted. Fortunately, the three programs above let you begin printing new addresses in any location on a sheet of labels. While I wouldn't recommend sending a half-empty sheet of labels through the high-temperature innards of a laser printer, if you're using an inkjet printer you should be fine. To save yourself the cost of ruined label sheets, make sure the addresses will print inside the label boundaries before printing them onto the actual label sheet. Always print your first page of addresses on plain paper, then hold that sheet behind a blank sheet of labels. If you hold them together in front of a bright window (or light), any misregistration will be obvious. Consider using clear or colored labels. Clear labels almost disappear on your envelopes and packages, while colored labels can add a new design element to your projects. Superior Labels, Uline, Online Labels, World Label, and other retailers offer labels in clear gloss, clear matte, silver and gold foil, pastels, vibrant colors, and fluorescents. Avery-branded labels are available from many retailers in clear, gold, silver, and matte white. For a more professional appearance, consider using a smaller label size for your return address, or get a rubber stamp made from your own custom design. Most office supply stores and shipping stores offer custom stamps for very reasonable prices. Consider using a larger label that gives you room to add your return address and additional design elements—possibly even a photo, logo, or your own monogram. 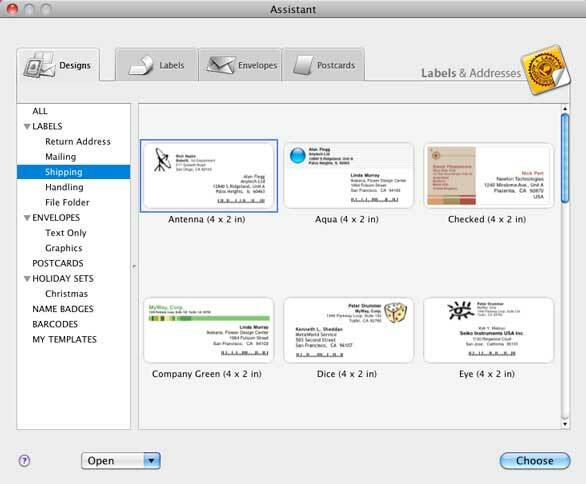 BeLight's Labels & Addresses is an industrial-strength mailing manager with sophisticated design tools. While Apple's Address Book does a commendable job of printing text in several formats (full sheets of labels and many sizes of envelopes), and while many people use Pages or Microsoft Word to create labels, the affordable programs above have additional powerful and valuable capabilities. They're also a lot more fun to use! This previously published article has been updated.